A new set of magazine scans for the latest Super Sentai series Kishiryu Sentai RyuSoulger has hit the Internet, giving fans a few details on some upcoming Dino Knight adventures! *Taking center stage this month are the two rouge RyuSoulgers- RyuSoul Black & RyuSoul Green! Despite participating in the Super Sentai Strongest Battle series, these Knights have thus far stayed away from the Druidon conflict- but that will change soon. 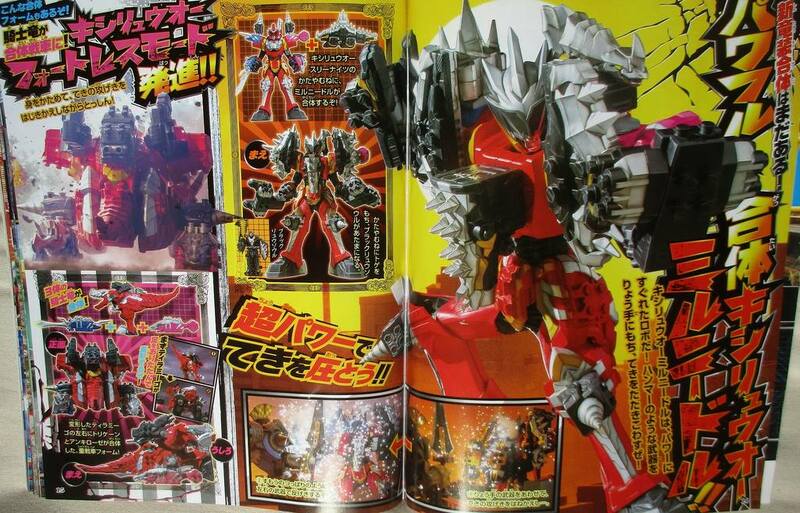 *RyuSoul Black’s signature Kishiryu, known as MiNeedle will unite with Red’s Tyramigo to form KishiRyuOh MiNeedle! This form grants unique new grappling abilities to the Mecha. *When all five RyuSoulgers » Continue Reading.